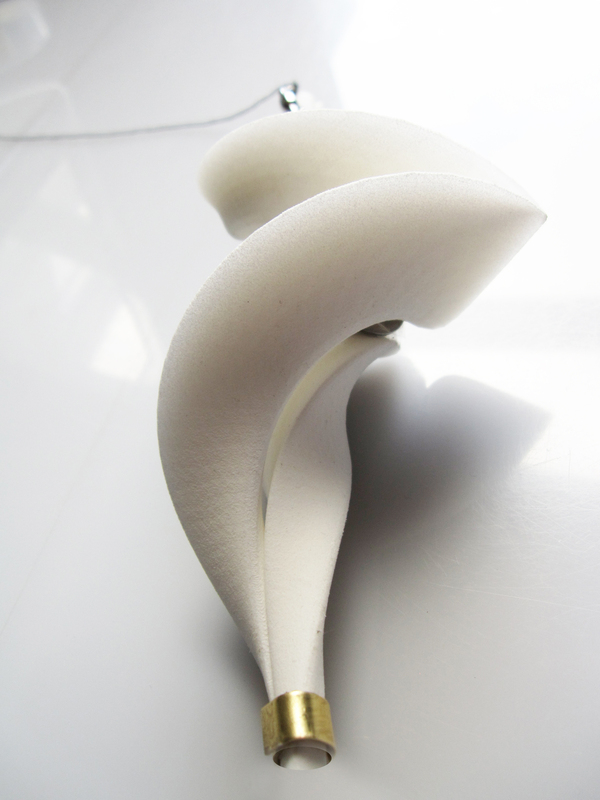 The 3d printed nylon polymer lamp designed by Dr. Margot Krasojević is suspended by a spindle whereby it’s weight and form contribute to the angular momentum vector as it spins along its axis of rotation; it is affected by minor environmental changes such as temperature and air currents which rotate the light along its path of velocity. 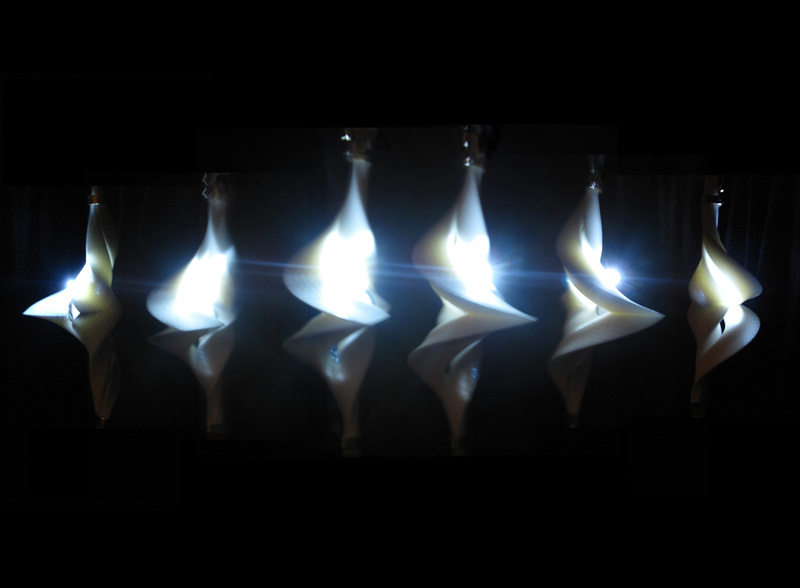 The light has a motion sensor diode clamped between both suspended 3d printed sections which powers the battery lighting the LED when in motion. As a result of it’s form, the light speeds up tremendously due to it’s conservation of angular momentum, the form of the light reduces it’s rotational inertia affecting it’s rotational speed which must increase to maintain constant angular momentum resulting in a brighter light. The light has been influenced by the physics behind ice skater spinning/a spinning top. The light weighs 145g, the material is a nylon polymer but also available in a lightweight polished white ceramic glaze which does not have as much resistance to move as a result of air friction unlike the rougher edged polymer which tends to slow down rotation at a faster rate than the ceramic coated shell. The light is comprised of two vertical elements which lock into one another using clamps, as the light turns a dynamo transforms kinetic energy from the light’s movement into electricity that is used to power the LED. 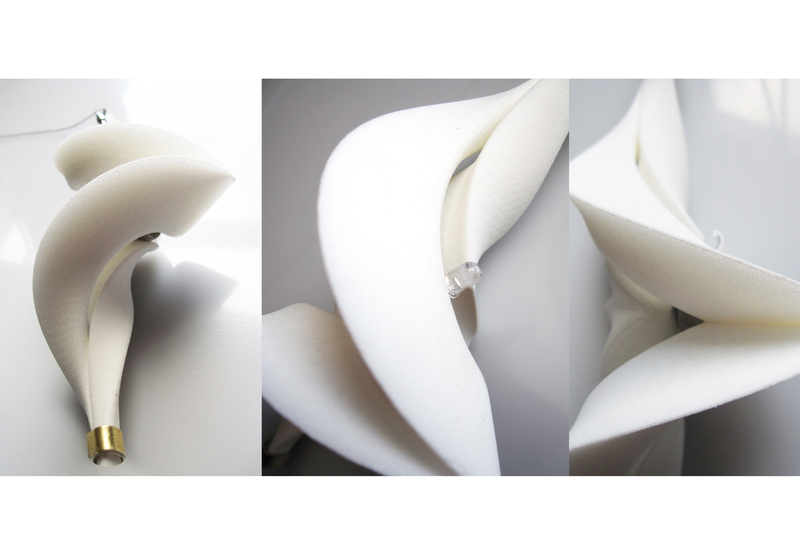 This dynamo is an electrical generator which is clamped between the two 3d printed vertical elements, so that when they spin the movement is turned into electricity, the faster the light spins the brighter the LED. Currently the light is being adapted to line the inside of the 3d printed elements with copper coil, using powerful magnets attached to the spindle within the vertical axis of the light and a separate magnet mounted to the 3d printed elements ensures that as they rotate the magnets on the 3d printed elements closely pass by the magnet suspended on the spindle, causing it to induce an electric current that lights the LED. As the light rotates faster, the LED lights brighter. Also in consideration is the application of a piezoelectric zinc element which produces a current as the light rotates, this current is strong enough to light a 1.5V LED. Investigations in the field of semi-conductors contribute to affordable, sustainable lighting for the future, a technology that is one of the design criteria for this light series.